You know you need to eat more fruits, vegetables and whole grains to improve your cholesterol numbers, but a diet to lower cholesterol is filled with more than fiber and rabbit food. It's a diet rich in healthy fats such as olive oil and walnuts and in proteins like salmon. Knowing all the delicious and healthy food options can help make low-cholesterol meal planning and eating enjoyable. Consult your doctor or dietitian about your diet for cholesterol. Cholesterol is not all bad; you need it to help make hormones, vitamin D and substances that aid in the digestion of fats. But your body already makes enough to do these jobs. There's also cholesterol in food, but it's the saturated and trans fats in the food you eat that cause your body to make too much cholesterol. The publication "Dietary Guidelines for Americans, 2010" suggests you limit your intake of dietary cholesterol to under 300 milligrams a day. Additionally, the American Heart Association suggests you keep saturated fat intake to less than 5 percent to 6 percent of total calories and reduce percent of calories from trans fats. Low-density lipoprotein, the "bad" cholesterol, travels through your blood and sticks to artery walls, which causes them to narrow and increases risk of heart disease. High-density lipoprotein takes cholesterol to your liver, where it is processed and eliminated from your body. Fat travels in your bloodstream via triglycerides, which also affect cholesterol levels. In your blood and liver, triglycerides combine with proteins to make cholesterol. Keeping your triglyceride numbers down may also benefit your cholesterol numbers. 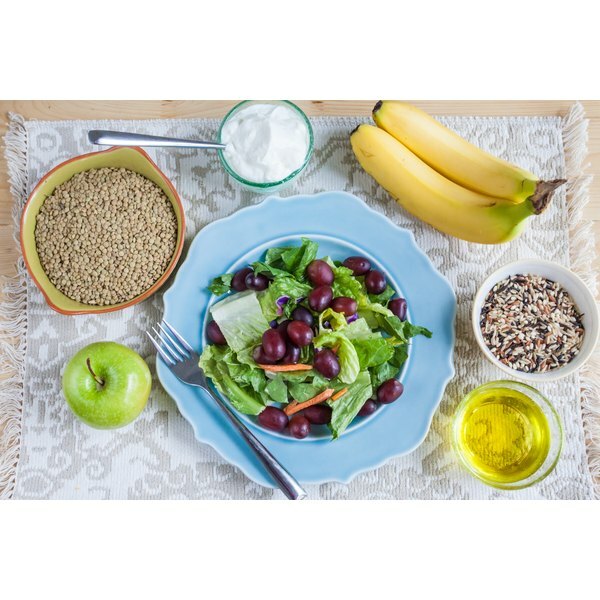 A daily diet to lower your cholesterol should include four to five servings of fruits and vegetables; six to eight servings of grains, with at least half of them whole grains; two to three servings of low-fat or fat-free milk or milk alternative; and 5 to 6 ounces of lean meat or poultry -- or plant protein, such as soy -- according to the American Heart Association. Additionally, have two to three servings of fatty fish such as trout or salmon two to three days a week and 1/2 ounce of seeds or 1/2 cup of legumes four to five days a week. Certain foods contain nutrients that help lower blood cholesterol by preventing your body from absorbing or helping to eliminate it from your body. Oats, barley, beans, eggplant, okra, apples, grapes and oranges contain soluble fiber, which binds with cholesterol in your digestive tract and drags it from your body. Trading in your butter for vegetable oils such as olive or sunflower oil also helps improve cholesterol. Eating 2 ounces of almonds, walnuts or peanuts a day may reduce your LDL cholesterol by 5 percent, according to the Harvard Medical School. In order for your cholesterol-lowering meal plan to work, you need to limit your intake of foods high in saturated and trans fat. This includes heavy cream, full-fat dairy foods, butter, stick margarine, shortening, lard, high-fat processed meats such as bacon and bologna, fatty meats, organ meats such as liver, baked goods made with saturated or trans fats and fried foods. You might start your day off with a bowl of oatmeal with raisins and a cup of fat-free milk or milk alternative such as soy or almond milk. At lunch, top salad greens with grilled tuna or marinated and grilled tofu, chickpeas, walnuts, balsamic vinegar and olive oil and serve with bowl of fresh strawberries, whole-grain crackers and a container of fat-free yogurt for a delicious cholesterol-lowering meal. Fill a whole-wheat tortilla with pureed black beans and sauteed pepper and onions and serve with salsa, quinoa and roasted carrots for dinner. For omnivores, replace the pureed black beans with sliced chicken breast. A 2-ounce serving of almonds with a fresh orange makes a healthy snack.